Laney have a reputation for building hard-hitting guitar amplifiers, and this has been reinforced by their long association with Black Sabbath guitarist Tony Iommi. 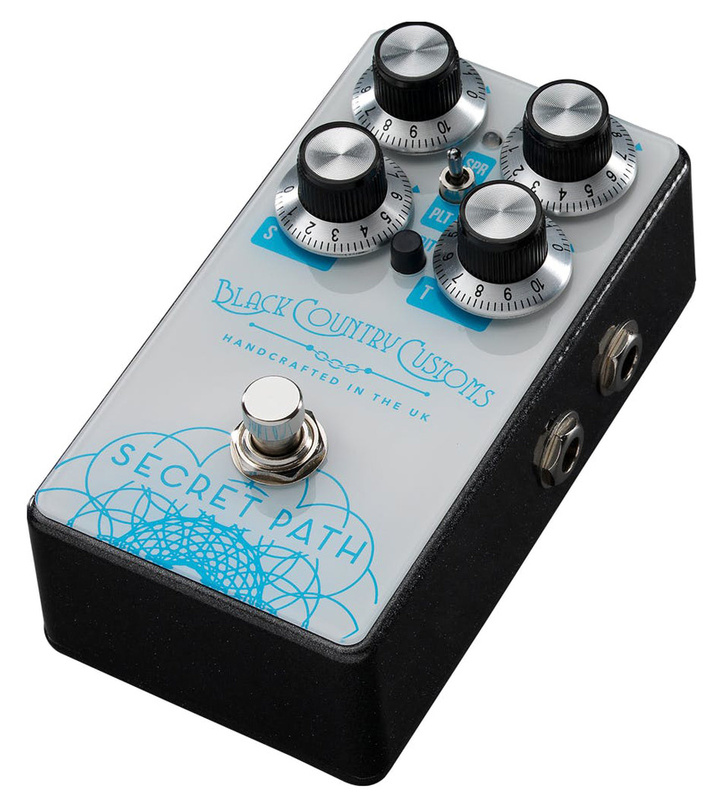 That they should branch into building their own guitar pedals under the Black Country Customs banner is no surprise, but alongside the expected blood-and-guts overdrives there's a surprisingly sophisticated reverb pedal called the Secret Path; it includes features that may even win over the ambient musicians amongst us! Built into a cast-metal case measuring 58.5 x 74 x 121.55mm, the pedal sports four jack sockets for a mono input, an expression-pedal input, and stereo outputs. Power comes from an optional external 9V PSU or your usual pedalboard supply — given the current drain of digital units like this, removing the battery powering option is, in my view, a sensible choice. The device has a buffered bypass to preserve reverb tails and to avoid tonal loss when long cables are used. The Secret Path has an Enhanced mode which is accessed by pressing and holding the footswitch for more than two seconds. After this time, the tri-colour status LED blinks to confirm that you've switched modes. In fact, the LED follows lots of actions, giving plenty of useful visual feedback. In Enhanced mode, modulation can be added to the Spring and Plate reverbs, and if Secret Path is selected an octave-up shimmer effect is added. Adjustments to these new additions are made by holding down the Edit button in the manner of a shift key, then turning the S knob to adjust the degree of the added effect. When the Edit button is released, your modifications are saved. (A note in the manual says you have to reset the S knob to its original position after editing to get back to your original reverb decay time.) With the pedal in standard mode, a connected expression pedal will control the wet/dry mix, while in Expanded mode the pedal controls the mix of the modulation or shimmer effect, depending on which reverb type is selected. Putting on my Mr Picky hat just for a moment, I would have preferred it if the Mix knob had been designed so that it could go all the way to fully wet, and I found the knob positions a little hard to read. But that is all the criticism I can muster: on the whole this pedal sounds extremely good, with an extraordinarily good spring reverb algorithm, a very refined shimmer effect, and a practical range of more conventional reverb types. It works in any genre, from surf and blues to ambient styles, and it's quiet enough for studio use too — a context in which the stereo outputs can easily be put to good use. Its closest rival for flexibility and price is probably the Electro-Harmonix Oceans 11, which offers a little more functionality but has only a mono output.